Letting properties require inspections, whether it be a check-in and check-out inventory, general condition inspection or any other type of inspection. The slide-out panel presents a form to be completed. Select the name of the BDP user who is responsible for the inspection. Any automation configured through BDP Command will be sent to the assigned contact if applicable. Select the date and time of the inspection. Select the inspection type from the drop-down list. Complete the notes as required. 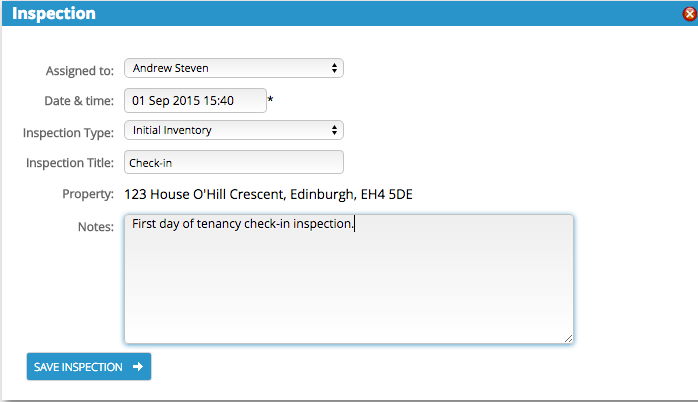 Each letting property and each tenancy contains an Inspections widget. This widget lists all past and present inspections.